In a paper published in Physical Review Letters , a group of scientists from the Vienna University of Technology (TU Vienna), Austria and Universität Würzburg, Germany have reported observation of a strong Faraday effect or the rotation of the polarization of light by means of a ultra thin semiconductor. This can be used to create a transistor that works with light instead of electrical current. Light waves can oscillate in different directions – much like a string that can vibrate up and down or left and right – depending on the direction in which it is picked. This is called the polarization of light. Physicists at the Vienna University of Technology have now, together with researchers at Würzburg University, developed a method to control and manipulate the polarization of light using ultra thin layers of semiconductor material. For future research on light and its polarization this is an important step forward – and this breakthrough could even open up possibilities for completely new computer technology. The experiment can be viewed as the optical version of an electronic transistor. The polarization of light can change, when it passes through a material in a strong magnetic field. This phenomenon is known as the “Faraday effect”. The magnetic field in the thin layer rotates the light waves. “So far, however, this effect had only been observed in materials in which it was very weak”, professor Andrei Pimenov explains. He carried out the experiments at the Institute for Solid State Physics of the TU Vienna, together with his assistant Alexey Shuvaev. Using light of the right wavelength and extremely clean semiconductors, scientists in Vienna and Würzburg could achieve a Faraday effect which is orders of magnitude stronger than ever measured before. Now light waves can be rotated into arbitrary directions – the direction of the polarization can be tuned with an external magnetic field. Surprisingly, an ultra-thin layer of less than a thousandth of a millimeter is enough to achieve this. “Such thin layers made of other materials could only change the direction of polarization by a fraction of one degree”, says Pimenov. If the beam of light is then sent through a polarization filter, which only allows light of a particular direction of polarization to pass, the scientists can, rotating the direction appropriately, decide whether the beam should pass or not. The key to this astonishing effect lies in the behavior of the electrons in the semiconductor. The beam of light oscillates the electrons, and the magnetic field deflects their vibrating motion. This complicated motion of the electrons in turn affects the beam of light and changes its direction of polarization. In the experiment, a layer of the semiconductor mercury telluride (HgTe) was irradiated with light in the infrared spectral range. “The light has a frequency in the terahertz domain – those are the frequencies, future generations of computers may operate with”, Pimenov believes. “For years, the clock rates of computers have not really increased, because a domain has been reached, in which material properties just don’t play along anymore.” A possible solution is to complement electronic circuits with optical elements. In a transistor, the basic element of electronics, an electric current is controlled by an external signal. 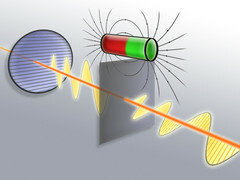 In the experiment at TU Vienna, a beam of light is controlled by an external magnetic field. The two systems are very much alike. “We could call our system a light-transistor”, Pimenov suggests. Before optical circuits for computers can be considered, the newly discovered effect will prove useful as a tool for further research. In optics labs, it will play an important role in research on new materials and the physics of light. A. M. Shuvaev, G. V. Astakhov, A. Pimenov, C. Brüne, H. Buhmann, and L. W. Molenkamp, "Giant Magneto-Optical Faraday Effect in HgTe Thin Films in the Terahertz Spectral Range", Phys. Rev. Lett. 106, 107404 (2011). Abstract.